FlightGear forum • View topic - New built-in moving map ??? How to install ???? New built-in moving map ??? How to install ???? Wow a New built-in moving map by Thorsten Renk ??? I will use that but I don´t know how. Who can give me support ??? What to do with Flight Gear (properties, wizard etc). How do I get the installer for Windows. I use jpmapview since 2011 but for this moving map, I am interested. Re: New built-in moving map ??? How to install ???? not in 3.0, not by ThorstenR, but by TorstenD, not integrated, external, it's browser-based (and depends on your internet connection to download those images), - see the newsletter for details. 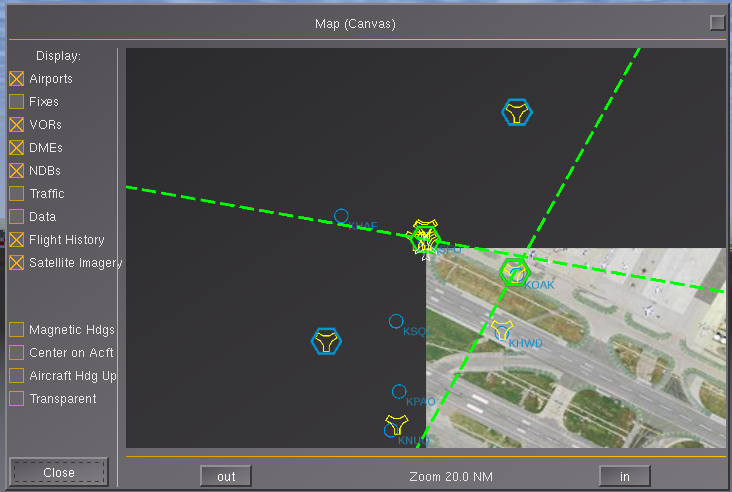 For an integrated/built-in moving map, your best bet is probably going to be a Canvas-based tiled map, which we've been working towards, it will not (yet) look as fancy as Torsten's moving map, but it can trivially be extended to show web based maps, and even include traffic feeds (AIS/TCAS/ACARS) by adding custom MapStructure layers, which are typically 50 lines of Nasal code. (The C++ code for this will be in 3.2, but the Nasal/MapStructure layers are still experimental (as can be seen)), and we're hoping to provide built-in caching, as well as some other enhancements that are possible through Canvas. The main "disadvantage" in comparison to the browser-based map (or atlas) is that this integrated, i.e. runs in the FG main loop and will affect frame rate and performance. In the meantime, I use the FlightGear version 3.3.0 (Jenkins Windows Nightly # 1720). So I tried the 8080 / gui / map. How can I use this map on my notebook. My laptop is connected to a local network with the FlightGear computer. Must then a Property are set ??? Or do you have a tool made ????? See Torsten's postings on the devel list - basically, you only need to start up FlightGear with the --httpd option and then use your browser to connect to localhost and the corresponding port - once that works, you can also access the same services from other computers on the corresponding subnet (e.g. wifi/wlan/lan). Torsten recently mentioned on the devel list that he's hoping to the see the documentation improved over time - for now, I'd suggest to refer to his postings and examples. You are obviously invited to add those to the wiki to help "kick start" some documentation, I am sure that others will appreciate your efforts and join sooner or later. Obviously, any connectivity instructions may be affected by your local network/router setup, as well as firewalls etc.